Place the chicken breasts and Italian dressing into a resealable plastic bag. Mix together to coat the chicken with the dressing, squeeze out excess air, and seal the bag. Marinate in the refrigerator for 1 hour. Preheat and outdoor grill for meduim-high heat, and lightly oil grate. Remove the chicken from the marinade and shake off excess. Discard the remaining marinade. Grill the chicken breasts until no longer pink in the center, or to an internal temperature of 165 degrees F (74 degrees C), about 3 minutes per side. Set aside to cool while preparing the ingredients for salad, then dice. Toss the diced apple with the lemon juice in a large mixing bowl until well coated; drain and discard any excess lemon juice. 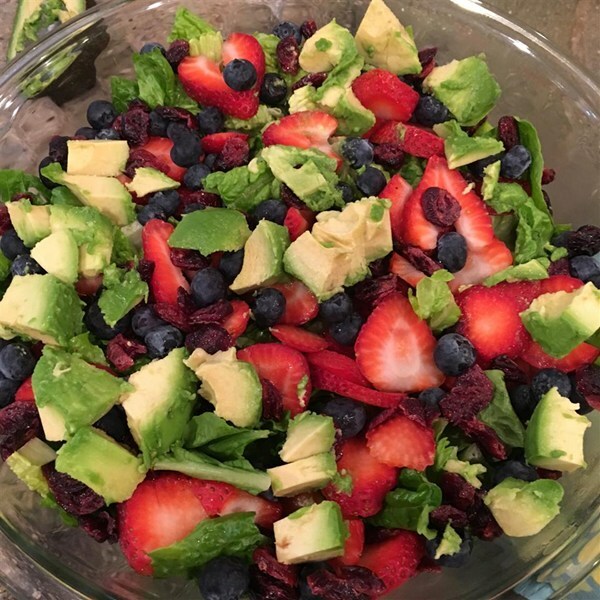 Place the lettuce into the mixing bowl, then sprinkle with the diced chicken, avocado, feta cheese, strawberries, and cranberries. Gently toss the salad with the balsamic vinaigrette, and serve immediately.